Stress resilience and maintaining a positive mental outlook are two factors that are as important to our health as eating a healthy diet. 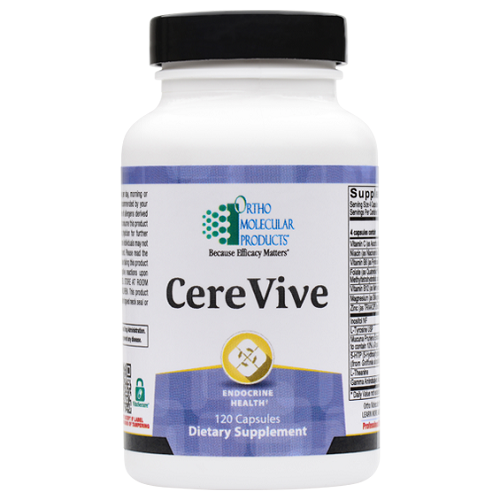 CereVive is formulated to support these factors and promote a relaxed, focused state. 4 capsules twice per day, morning and lunch on an empty stomach or as recommended by your health care professional. Gamma-amino butyric acid (GABA) is one of the major inhibitory neurotransmitters in the brain. GABA provides a calming effect and is a primary component of the body’s stress fighting mechanisms. GABA is also available as dietary supplement. Most commercially available forms of GABA utilize synthetically-produced GABA, manufactured from pyrrolidinone, a compound not allowed for use in Japan. CereVive includes a patented, naturally-sourced, non-synthetic form of GABA called PharmaGABATM. It is produced naturally by the friendly bacteria, Lactobacillus hilgardii. In contrast to synthetic GABA sources, PharmaGABATM has been shown in published research studies to promote relaxation effects in the central nervous system (CNS). In a double-blind study using healthy volunteers, EEG readings were obtained after 100 mg of PharmaGABATM was administered. PharmaGABATM produced a highly significant increase in alpha waves, as well as a significant decrease in beta waves, when compared to the control group. Alpha brain waves are associated with relaxed and effortless focus, while beta waves are associated with stress, restlessness and scattered thoughts. Therefore, an increase in alpha to beta waves is associated with improved concentration and a state of centered relaxation. 5-Hydroxytryptophan (5-HTP) is an amino acid intermediate that is directly converted into the mood-regulating neurotransmitter, serotonin. Maintaining a healthy serotonin level is important regulating appetite and sleep cycle and for supporting a sense of calmness. As a dietary supplement, 5-HTP is produced naturally from the seeds of the African plant, Griffonia simplifolia. In contrast to L-tryptophan, 5-HTP provides efficient conversion into serotonin because it does not need prior conversion by tryptophan hydroxylase. 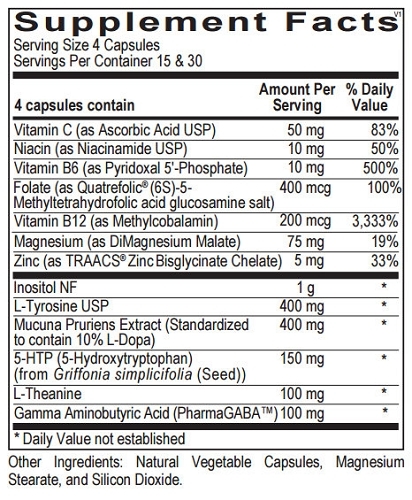 4 capsules taken 1-2 times per day on an empty stomach or as recommended by your health care professional. Wheat, gluten, soy, animal or dairy products, fish, shellfish, peanuts, tree nuts, egg, artificial colors, artificial sweeteners or preservatives. If you are pregnant, nursing or taking any medications for depression or anxiety, consult your health care professional before taking this product. 1. Yokogoshi H, Kobayashi M, Mochizuki M, Terashima T. Effect of theanine, r-glutamylethylamide, on brain monoamines and striatal dopamine release in conscious rats. NeuroChem Res 1998; 23(5):667-73. 2. Nobre AC, Rao A, Owen GN. L-theanine, a natural constituent in tea, and its effect of mental state. Asia Pac J Clin Nutr 2008; 17 Suppl 1:167-8. 3. Kakuda T, Hinoi E, Abe A, et al. Theanine, an ingredient of green tea, inhibits [3H]glutamine transport in neurons and astroglia in rat brain. J Neurosci Res 2008;86(8):1846-56. 4. Abdoua AM, Higashiguchi S, Horie K, et al. Relaxation and immunity enhancement effects of ?-Aminobutyric acid (GABA) administration in humans. BioFactors 2006;26:201-208. 5. Colodny L, Hoffman RL. Inositol- Clinical Applications for Exogenous Use. Altern Med Review 1998; 3(6):432-447. 6. O’Neil MF, Moore NA. Animal models of depression: are there any? Human Psychopharmacology 2003; 18:239-254. 7. Birdsall TC. 5-Hydroxytryptophan: a clinically-effective serotonin precursor. Altern Med Review 1998; (3)4: 271-1998. 8. Fernstrom JD, Fernstrom MH. Tyrosine, phenylalanine, and catecholamine synthesis and function in the brain. J Nutr 2007;137;1539S-1547S; discussion 1548S. 9. Shukla KK, Mahdi AA, Ahmad MK, Shankhwar SN, Rajender S, Jaiswar SP. Mucuna pruriens improves male fertility by its action on the hypothalamus-pituitarygonadal axis. Fertl Steril 2009; 92(6):1934-40. 10. Kaplan, Bonnie J, Crawford, et al. Vitamin, minerals, and mood. Psychological Bulletin 2007; Vol 133(5):747-760. 11. Miller AL. The methylation, neurotransmitter, and antioxidant connections between folate and depression. Altern Med Review 2008;13(3):216-226. 12. Prior PL, Galduroz JC. Glutaminergic hyperfunctioning during alcohol withdrawal syndrome: therapeutic perspective with zinc and magnesium. Med Hypothesis 2011 77(3):368-70.